I have always loved songs by Burl Ives. When Rudolph the Red Nose Reindeer comes on at Christmas, I usually will pause and perhaps will watch the whole show just to hear his renditions of the popular Christmas/children’s songs. There is something so charming about Ives and his voice. When I learned that his gravesite was near Newton, Illinois where I was going to cover a plow day, I decided to check it out. I was delighted when I found that there is more to see in the area than just Ive’s grave. My friend Jane Elliott and I started out our day heading to Newton to Joe’s Plow Day, and on the way while in Newton we traveled across the Burl Ives Bridge. Located on Highway 130, the Illinois Department of Transportation has even erected a plaque in Ives honor. Since we had a bit of a time finding our original destination, we drove over this lovely bridge that goes over the Embarras River several times! 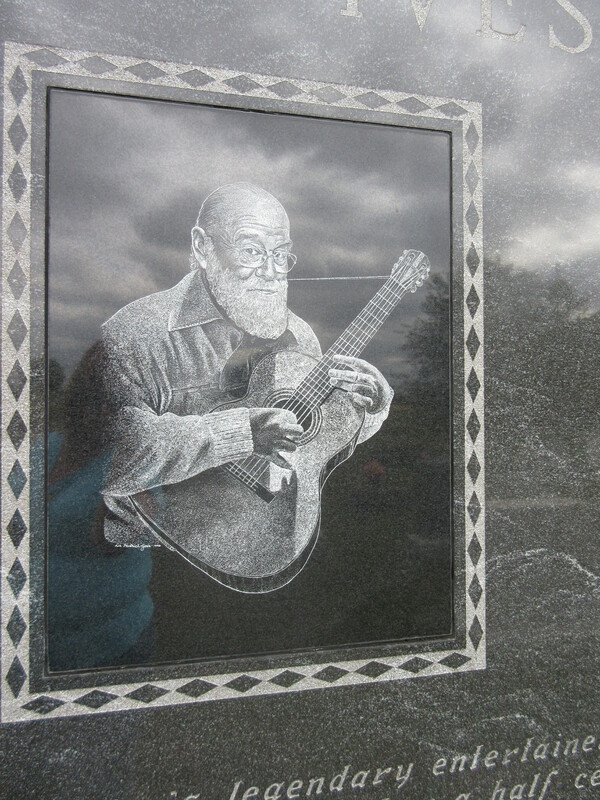 After the plow day, we were going to Mounds Cemetery to Burl Ives grave and learned from friends at the plow day that there was also a life sized statue of Burl ives sitting on a bench holding his guitar. The statue is located in downtown Newton’s Memorial Square and was placed in October of 2014. Jane had spied the statue on our way to the plow day but told me, “I didn’t want to distract you,” so I didn’t say anything. Since Garmen wasn’t doing her job that day, I was easily distracted and that was smart thinking on Jane’s part! An upcoming story in the Prairieland Buzz covers the sites and Burl Ives history. You can read all about his accomplishments and how this tenant farmer’s son that was one of seven children began singing at four years old and never stopped. Born in Hunt City not far from Newton, there is no Burl Ives home to visit, it is long gone, but the statue, bridge and his gravesite are wonderful tributes to a man that recorded over 100 hits and starred in several plays and movies, edited folk song collections and found his way into our hearts. Born in 1909, Burl Ives passed away in 1995. If in Jasper County, Illinois and looking for a nice drive and an educational afternoon, stop and find out about Burl Ives and check out the memorials erected in his memory. Finding the gravesite can be a bit tricky, but the cemetery is up on a mound. While we were there a farmer was harvesting his crop in the field below and besides learning more about one of my musical heroes, we were able to see early fall at its best. Check it out, I am sure like Jane and I, you will be glad you did. Previous Post: Angels Among Us – a sign from the angel tree.